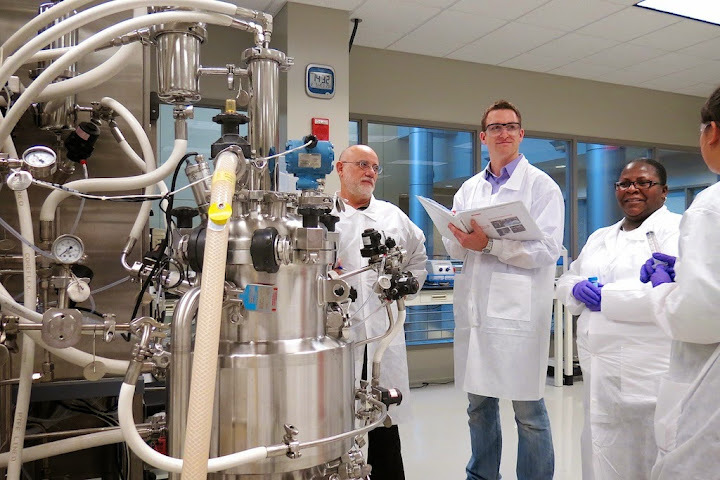 Founded to help establish, attract and expand biomanufacturing in North Carolina and thus drive innovation and job creation, BTEC provides educational and training opportunities to develop skilled professionals for the biomanufacturing industry and create the best-trained, most industry-focused workforce possible. It is located on North Carolina State University's Centennial Campus and operates under the auspices of the university's College of Engineering (COE). The 82,500-gross-square-foot center, the largest of its kind in the U.S. and the world, features more than $12.5 million of industry-standard equipment and a simulated cGMP (current Good Manufacturing Practice) pilot plant facility capable of producing biopharmaceutical products using cell growth and expression, recovery and purification processes in a sterile environment. Undergraduates, graduate students, and working professionals come to BTEC for hands-on learning with the latest biomanufacturing technologies. Researchers at NC A&T State University in Greensboro, NC have developed a method to reduce the amount of allergens in peanuts by 98%. Initial research was supported through a grant funded by the US Agency for International Development, and subsequent research has been funded by the USDA's Agriculture and Food Research Iniative. Led by Dr. Jianmei Yu, the research team developed a process that treats roasted peanuts that have been removed from the shell and skin with food-grade enzymes commonly used in food processing. Peanuts cause serious allergic reactions in an estimated 0.9% of the U.S. population, which equates to about 2.8 million people. Dr. Eric Elbogen, an associate professor at UNC-Chapel Hill and clinical psychologist at the Durham Veterans Affairs Medical Center. Dr. Elbogen is currently Principal Investigator of an NIMH funded R01 examining the effects of Post-Traumatic Stress Disorder (PTSD) and Traumatic Brain Injury (TBI) on violence and aggression among Iraq/Afghanistan Veterans. He is Principal Investigator (PI) of a U.S. Department of Education funded project investigating improving financial capacity among veterans with psychiatric disabilities. He is also PI of a U.S. Department of Defense funded randomized clinical trial of a cognitive rehabilitation intervention to improve executive function in Veterans with PTSD and TBI. Click the link above to see some results of his research. The Simon Green Atkins Community Development Corporation is a non-profit that was created to revitalize the neighborhoods surrounding Winston-Salem State University in Winston-Salem, NC. The organization focuses on housing, community, and economic development through a variety of initiatives that take advantage of resources provided by WSSU and the U.S. Department of Housing and Urban Development. The SGACDC was recently featured on the HUD website as a case study of urban renewal. So far, improved housing and business environment in the area has contributed to a $2 million increase in the area's tax base, as well as drastically improving town-gown relations. The UNC Research Opportunities Initiative provides targeted funding for innovative and potentially game-changing research projects. These projects have the potential to promote economic development and position North Carolina as a leader in strategically important research areas. The ROI represents North Carolina’s first financial investment in the UNC system’s five-year strategic plan.